KFC's fried chicken-pizza hybrid, the Chizza, makes a second appearance over in Japan and, this time, comes topped with beef. 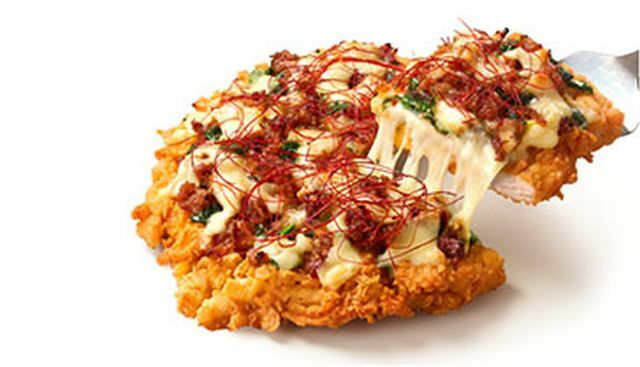 Specifically, the new Bulgogi Chizza features a boneless Original Recipe fried chicken filet topped with mayo, spinach, marinated sliced of bulgogi beef, cheese, and thin threads of dried chili pepper. Basically, it's a Korean-themed Chizza as both bulgogi and the chili threads are staples of Korean cuisine. While it still hasn't made an appearance here in the US, the Chizza has been making the rounds internationally since it first appeared back in 2015 in the Philippines. Most recently, it's arrived in China, where it comes topped with bell peppers, marinara, cheese, corn, and pineapples (which is more or less the original Chizza). It'll be curious to see if this ever makes it to our sunny shores though. Given that KFC has largely (beyond the Double Down) avoided gimmicky food mashups so far here.